Butler’s Erin Dean returns a shot during Butler’s 3-2 win over Greenville on Tuesday, Sept. 11. Jo Velasco prepares to return a shot during Butler’s 3-2 win over Greenville on Tuesday, Sept. 11. Hannah Scarpelli returns a shot during a doubles match during Butler’s 3-2 win over Greenville on Tuesday, Sept. 11. Butler’s Xia Lin returns a shot during Butler’s 3-2 win over Greenville on Tuesday, Sept. 11. VANDALIA — The three-way log jam atop the Greater Western Ohio Conference American North division was broken up this week as the Butler Aviators, with a little help from Greenville, seized first place all alone after a 4-1 win over Troy on Thursday. That win, and Greenville’s win over Tippecanoe, left the Aviators at 7-0 in league play and 11-3 overall. Tipp and Troy are both 6-1 with Greenville and Sidney just behind at 5-1. Butler’s Xia Lin defeated Katie Sherrick 6-2, 6-2 at first singles and Erin Dean defeated Hailey Taylor 6-1, 6-1 at second singles. Troy’s Mackenzie Nosker took a tough win over Jo Velasco 7-5, 6-3 at third singles. In doubles, Ashley Hess and Hannah Scarpelli defeated Cady Rhea and Kit Wolke 6-1, 6-1 at first doubles and Rachel Burton and Tori Studebaker blanked Troy’s Esha Patel and Ainsle Savard 6-0, 6-0 at second doubles. 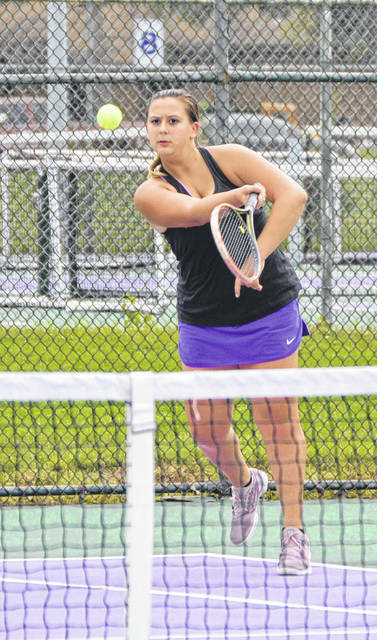 VANDALIA — The Butler girls tennis team survived a strong challenge from the visiting Green Wave of Greenville by a 3-2 score on Tuesday at Helke Park. Tuesday’s match pitted the top two teams in the league from a year ago, and Greenville mounted quite a challenge against the defending champs. Butler’s Xia Lin defeated Natalie Milligan 6-1, 6-2 at first singles, but Greenville took the other two singles matches. Emily Marchal took down Erin Dean 6-4, 6-3 and the Wave’s Abby Swensen defeated Jo Velasco 6-1, 6-0. Butler duo Ashley Hess and Hannah Scarpelli defeated Marabelle Lance and Anna Manges 6-3, 6-4 at first singles. 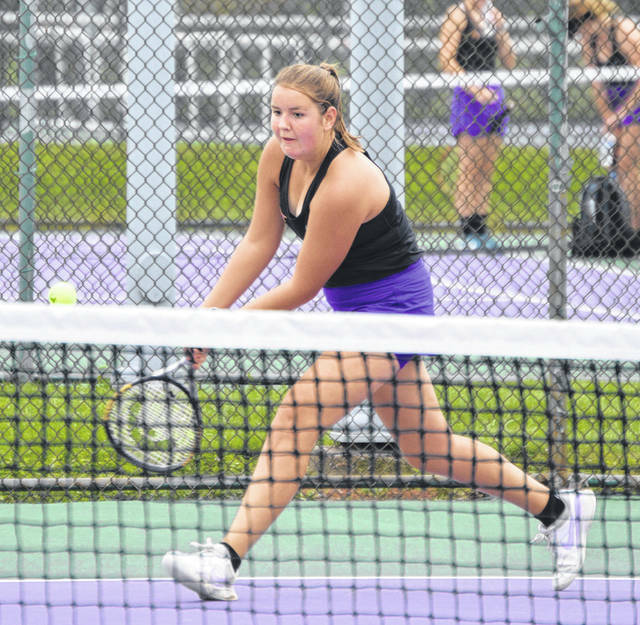 Greenville was forced to retire at second singles midway through the first set due to an injury with Butler’s Tori Studebaker and Rachel Burton facing Faith Mansfield and Felicity Lance. 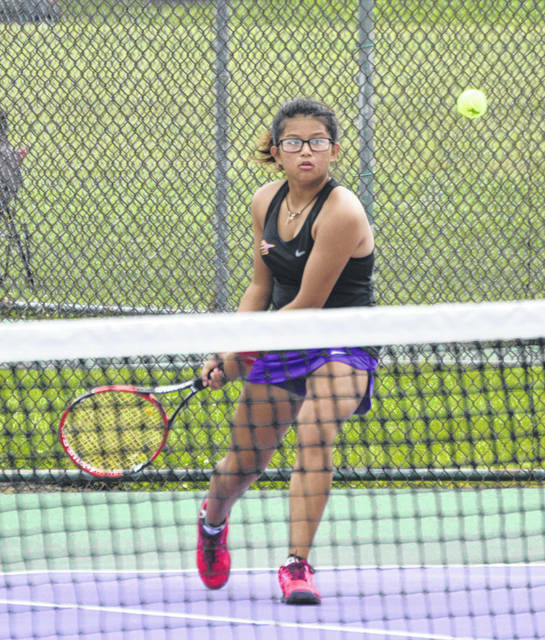 VANDALIA — With the match between Butler and the visiting Bulldogs of Milton-Union tied at 2-2 and a first singles match unfinished, Mother Nature intervened on Monday, Sept. 10 with Xia Lin clinging to a slim 3-2 lead in the third set. 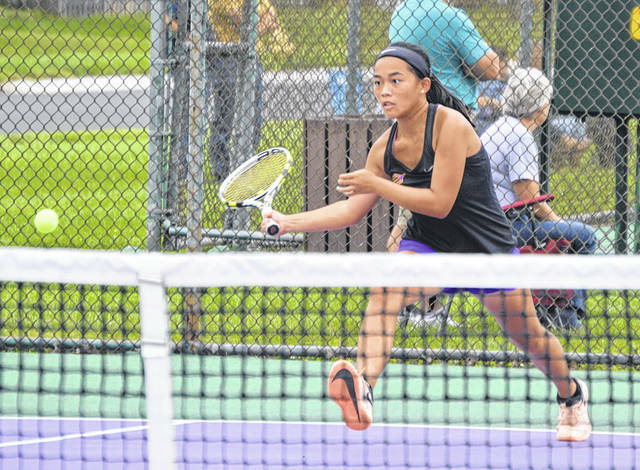 After a 45-minute rain delay, Lin swept the final three games to take a 6-1, 2-6, 6-2 victory that proved to be the difference for the Aviators. Milton-Union took both second and third singles matches with Taylor Falb defeating Erin Dean 6-3, 6-1 and Hannah Fugate defeating Jo Velasco 6-4, 6-4. Butle won both doubles matches with Ashley Hess and Hannah Scarpelli winning 6-2, 6-0 over Emma Lehman and Madison Silveira and Rachel Burton and Tor Studebaker winning 6-0, 6-1 over Paige Barnes. The Aviators have a busy week ahead as they host Piqua on Monday, travel to Sidney on Tuesday, host Bellbrook on Wednesday and Tipp on Thursday. On Saturday, Butler will compete in the CJ Doubles Tournament.